I am the Tasmanian head of the Modern Luddites club. Only one member, as it should be. I’m fighting to urge to go text you inanities. Incessantly. Counter-will. That’s how I roll. Lol! TEXT ALL THE THINGS!!!! My husband drive me bananas with his texts! I do wish we could go back! We resisted for so long with much success…why? Oh why?!?! 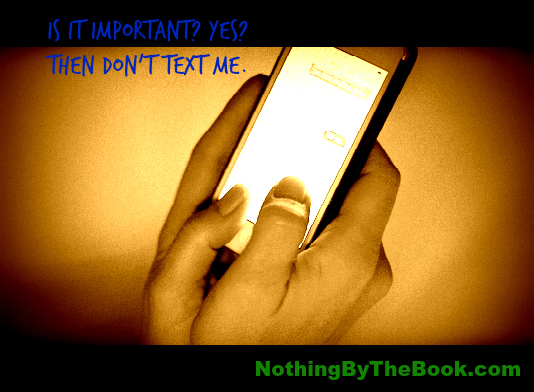 texts in our home are akin to rolling paper, placing in bottle and chucking bottle in ocean. A response is nice and in most cases, would save a life but really, should never be expected. My wife, like you, doesn’t want to be disturbed and I, like you, like my autonomy. Smartphones are really just digital versions of the new yorker…great things for the crapper and mostly disposable. Sean: I’m at Costco. Do you need any nuts? Sean: That’s a nice point of information. Jane: So you read my blog today, huh? Jane: Baby. Beautiful. I love you. Now buy me the goddamn cashews. Also detergent, kale, and kimchi. My friend the linguistic anthropologist says this communication style misfit is partially the result of him being Canadian, and me being mostly not. I think it’s because I place a high value on saying precisely what you mean-want. She says that’s impossible, because everything we ever communicate to another occurs through layers upon layers of filters we know nothing about… so we can never HEAR what the other person thinks she’s SAID. Moral of the story: We should all just stop talking to each other.